This cocktail table has a casual traditional style to it. It features beautiful turned legs, a beveled table top and a small drawer for storage. 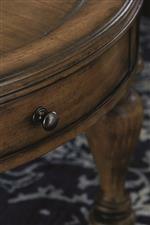 Use this piece in casual, cottage and classic styled homes. The Heartland Pine Rectangular Cocktail Table by Bassett at AHFA in the area. Product availability may vary. Contact us for the most current availability on this product.